* Built to last, our Ultimate Easel includes a built-in paper holder, two large 24" x 24" art surfaces (chalk, marker or washable magnet board), choice of natural wood or red plastic paint trays, and a paper cutte. * Add our optional Leg Extension Kit to make your easel adjustable to heights up to 53-1/2". Leg Extensions may be ordered with your Ultimate Easel or added later (order them in Easel Accessories). * The most flexible of our double-sided easels, this natural hard maple easel comes with a top mounted paper holder that positions a roll of art paper above both art surfaces, where it is very accessible. * A center storage platform holds the easel securely open during use (creating a sturdy A-frame tough enough for heavy use); pivoting the center platform up and out of the way allows an adult to fold the easel after simply removing one paint tray. * Paper rolls are sold separately. 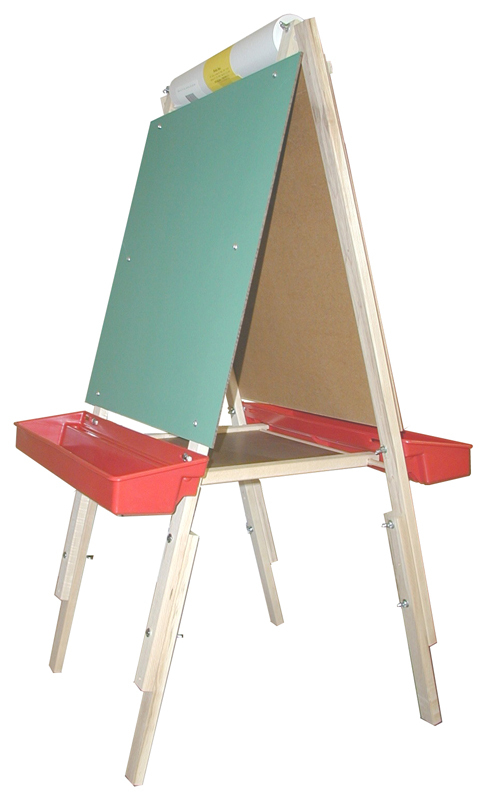 * Our Ultimate Easel comes assembled and ready to use at a height of 41-1/2"; just add the paint trays. * Adding our Leg Extension Kit allows the easel height to be adjusted from 42-1/2" - 53-1/2". Weight 19 - 25 lbs, depending on options selected. * Recommended age: 2+ years.